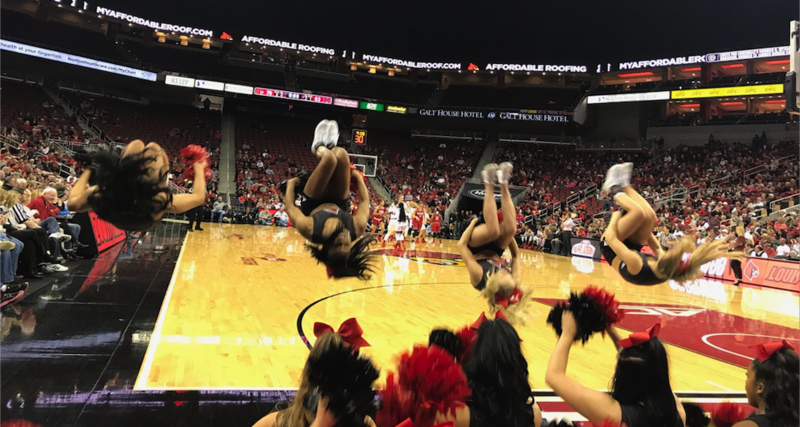 The University of Louisville cheerleaders had a busy night as well (Charlie Springer photo). Good to have them in town after a long absence, the University of Louisville women’s basketball team back at the KFC Yum! Center after five games on the road to open the season. They were missed. 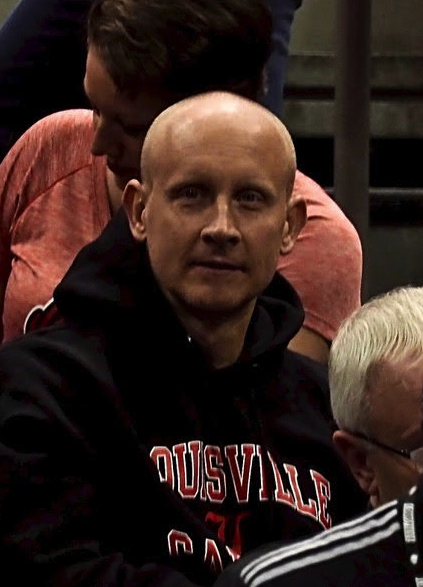 An interested spectator was Chris Mack, UofL men’s coach, attending the game with his wife Chrisi, a former Miss Kentucky Basketball. (Cindy Rice Shelton photo). Bringing their winning ways back to UofL, the Cardinals coasting to an impressive 95-73 win over Miami (Ohio) which had won its first four games. Never any doubt, with Louisville jumping out to an early 8-0 lead and widening it to 27-12 by the end of the first quarter. 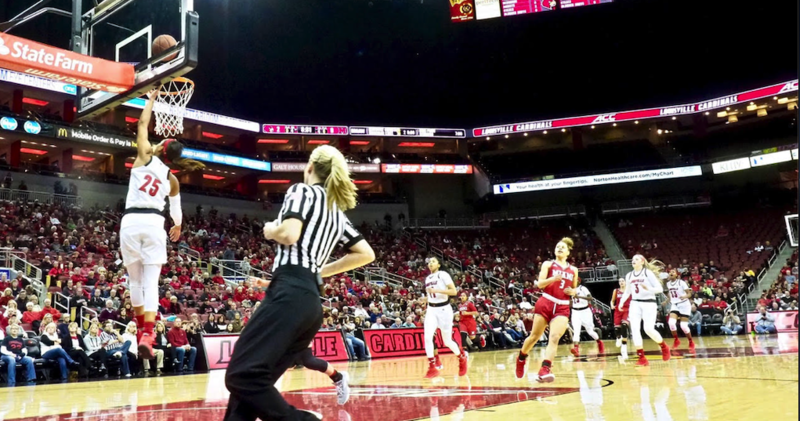 Exactly what the home crowd of 7,544 fans wanted to see, UofL improving its record to 6-0 on the season while handing the visitors their first loss in five games. Six players in double figures with Kylee Shook leading the way, with 17 points and six rebounds. More aggressive this game, hopefully a sign of things to come, especially with the loss of Yacine Diop to an ACL injury over the weekend. Let this be the next step forward in Shook’s career. Asia Durr with 16 points, Bionca Dunham with 15, Dana Evans 14, and Sam Fuehring and Jazmine Jones with 10 each. Lindsey Duvall, out last season with a leg injury, hitting two beautiful three-point shots. Good first impression in her first game on Denny Crum Court. Dana Evans with that lights out speed, making those layups while handing six assists. Coach Jeff Walz telling her she will could be an All-American if she continues at that pace. Walz on the receiving end of a pass at one point, going through the motions of taking a three-point shot to the delight of the crowd. He said later he regretted not taking the shot. Everything else going so right this night. Good to be home.